Revolution gives your cat 30 days of protection from certain parasites via a single application at the base of your cat’s neck. The active ingredient, selamectin, kills adult fleas and prevents flea eggs from hatching. It also protects your cat from ear mites, hookworms and heartworm disease. Don’t use Revolution without your veterinarian’s prescription; she will ensure that your cat is healthy enough to tolerate the treatment. Your cat must also be at least 8 weeks old. Before applying, make sure your cat’s fur is dry. You apply Revolution at the base of her neck, so check to make sure she doesn’t have any sores or broken skin in this area, as Revolution contains alcohol that can irritate broken skin. 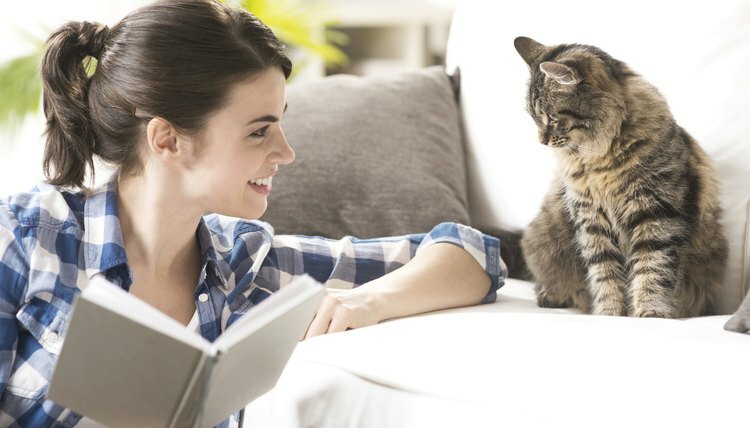 Revolution is easy for most cat owners to apply, but if this is your first time using it, or if your cat has a tendency to struggle, wear protective gloves to protect your fingers from contacting the Revolution -- or scratches from your cat. Revolution comes in tubes dosed according to your cat’s weight. Hold the tube with the cap pointing up, then press the cap down tightly; you’ll hear a snap when it punctures the tip of the tube. Keep the tube upright so you don’t spill the contents while you hold your cat firmly. Part her fur at the base of her neck until you see her skin, then turn the tube and squeeze the Revolution onto her skin until the tube is empty -- squeeze at least three to four times to get the full dose. Discard the empty tube; if you have small children, keep unopened and empty tubes well out of their reach. If you have other pets, treat them at the same time. Wash your hands after you apply Revolution, and don’t rub or massage the Revolution into your cat’s skin. Wait at least two hours after applying before you bathe your cat. If you got some on your fingers, don’t touch your hands to your eyes. Wash your hands and other exposed areas thoroughly and check for redness or a rash, particularly if you have a known sensitivity to alcohol; consult your doctor if you have any concerns about skin irritation. If you do get Revolution in your eyes, flush your eyes with water and contact your doctor. Store your remaining tubes safely out of reach. Vacuum floors and furniture regularly; daily if you’re treating a present flea infestation. Wash your cat’s bedding weekly, including any surfaces she frequents. You may notice a powdery residue, discoloration, or clumped, stiff hair at the application site; these minor side effects are temporary and not an indication that anything is wrong. While rare, contact your veterinarian immediately if your cat vomits, has diarrhea or loose stools, experiences muscle tremors, goes off her food or seems excessively tired.